The exposome represents a concept that incorporates the complex exposures we face as humans. Thank you for your interest in the exposome. There are tens of thousands of chemicals in our environment and more are introduced every day. 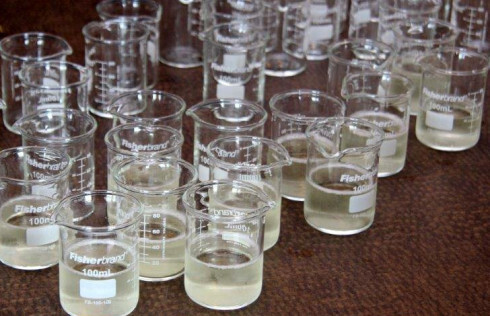 Some of these chemicals are pharmaceuticals that provide needed relief to people suffering from certain ailments or chemicals that help control the spread of disease, but when these chemicals end up in our water supply they present a possible health concern. We believe that the role of our environment is underappreciated in the biomedical research community. We need to learn more about how the environment influences our health, both in negative and positive ways. With this knowledge we can make better decisions in our personal lives and regulatory agencies can make better decisions about minimizing the adverse effects on populations. The exposome, conceptually and practically, provides a holistic view of human health and disease. It includes exposures from our diets, our lifestyles, and our behaviors. It also includes how our bodies respond to these challenges. When coupled with advances in genetics and medicine, we believe the exposome will help lead to improved strategies aimed at preventing and treating diseases, such as autism, diabetes, heart disease, and Alzheimer’s disease. We believe that pursuit of a Human Exposome Project, similar to the Human Genome Project or the BRAIN Initiative, will help reveal the importance of the environment in our lives. At this point the Human Exposome Project is just a vision. We hope to make it a reality. Please come back to see our progress. Click here for a brief background on the exposome! 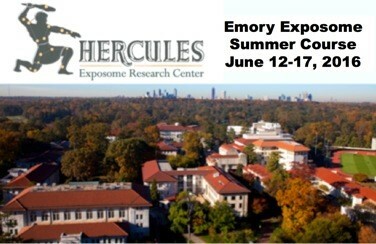 We want to thank everyone for their participation in the Emory Exposome Summer Course. Highlights from the course now available here! Our goal is to bring investigators together to formulate a plan to define the exposome in a way that is useful to those in health care and public health, to identify gaps in knowledge or technique, and to help develop a new generation of scientists who focus on these complex environmental influences on health. The human exposome is the environmental equivalent of the human genome. It is a representation of the complex exposures we are subjected to throughout our lives, including our diet, lifestyle factors, and social influences. It also incorporates how our bodies respond to these challenges. The exposome encompasses much of what we refer to as nurture. The term exposome was coined by Dr. Christopher Wild at the International Agency for Research on Cancer, World Health Organization. Several academic and government laboratories across the world are collecting data that can contribute to our understanding of the exposome. Our goal is to bring these investigators together to formulate a plan to define the exposome in a way that is useful to those in health care and public health, to identify gaps in knowledge or technique, and to help develop a new generation of scientists who focus on these complex environmental influences on health. The Human Exposome Project will build upon the already existing resources and work to identify additional funding to pursue the important questions in the field. The rapid advancement in the areas of genetics and genomics has transformed our understanding of human biology. However, genome-wide association studies (GWAS) have only been able to account for a minority of disease risk. Quantitative data on the environmental factors that influence health are desperately needed. The Human Exposome Project can help provide this important information in a form that can be used to directly impact human health.